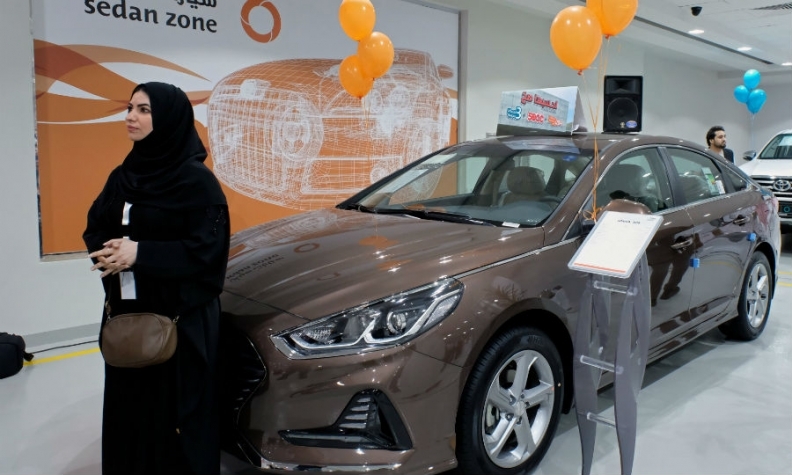 Saudi women flocked to the country's first female automotive showroom in Jeddah. JEDDAH -- A few months after Saudi Arabia granted women the right to drive, the kingdom's first female auto showroom has opened in Jeddah. Visitors flocked to the showroom's opening at Le Mall on Thursday as women posed for photos and selfies in front of the cars, surrounded by pink, orange and yellow balloons hung over the cars. The showroom focuses on fuel-efficient vehicles and provides a team of saleswomen to help the new customer base. A prominent sign in the showroom carries the slogan "Drive and Shop," a play on words in Arabic, using the female form of the verbs. "It is known that women are the largest section who shop in malls," said Sharifa Mohammad, the chief saleswomen. "This whole mall is run by women anyway. All the cashiers are women. Everyone in the restaurants are women." In a decree issued in September, King Salman ordered an end to the ban on women drivers by June this year. The conservative tradition of not allowing female drivers has limited women's mobility and been seen by rights activists as an emblem of their suppression. Crown Prince Mohammed bin Salman, 32, is seen as the face of that change. Many young Saudis regard his recent ascent to power as proof that their generation is now taking a central place in running the country. "I've always been interested in cars, but we didn't have the ability to drive," said Ghada al-Ali, a customer at the showroom. "And now I'm very interested in buying a car but I would like the payments and prices to not be very high."